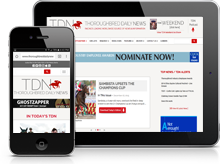 Anderson Thoroughbreds’ Parlor captured his 3-year-old debut in the easiest of fashion, coasting home 1 3/4 lengths clear of Musical America (Malibu Moon) without every truly being asked and earning ‘TDN Rising Star’ status. The dark bay wove through traffic with an impressive turn of foot to annex his initial start at Ellis Park Aug. 14 and followed with a narrowly beaten runner-up finish behind All Right (Dominus) in the seven-furlong Kentucky Downs Juvenile S. after steadying sharply entering the far turn Sept. 3. Hammered down to even-money favoritism for this return from the sidelines, the colt was away from the gate slowly and lagged at the back of the pack behind decidedly moderate fractions of :25.63 and :50.04. Waiting for a seam on the far turn, he bounded through inside of a tiring rival in upper stretch and kicked clear to score under minimal encouragement on a rain-softened turf course. The winner’s second dam is GSP Miss Mary Apples (Clever Trick). My McIntosh is also responsible for a 2-year-old Point of Entry colt named The Robert, who was acquired by Brad Anderson of Anderson Thoroughbreds for $100,000 as a Keeneland September yearling. The dam was most recently bred back to Noble Mission (GB). Sales History: $60,000 Ylg ’15 KEESEP. Lifetime Record: 3-2-1-0, $102,700.